Wednesday's faculty meeting was a exercise in near-disaster. I say that with all due respect. Meetings are, after all, hard to run. And they are not made any easier when the people at the meeting are busily spouting their on-the-spot revelations on housing and faculty-student interactions. President Charles M. Vest, who presided over Wednesday's meeting as he does all faculty meetings, could surely tell you this. And so, too, could former President Paul E. Gray '54, who gracefully rescued the meeting from its out-of-control state by finally calling the question on the issue at hand - Professor of Brain and Cognitive Science Stephan L. Chorover's flimsy substitute "sense of the faculty" motion. Never mind the fact that several faculty members had to ask aloud what it actually meant to call the question. After clearing that hurdle, the faculty approved the motion with just a handful of "no" votes. It was a mystery that the faculty needed to bother voting on the motion at all. Its transformed version was a hodge-podge of faculty hopes and dreams that anyone with an ounce of sense knows will never come to pass. Before the vote, J. Kim Vandiver PhD '75 presented the similar ideas of the Orientation/ Residence committee (otherwise known as the O/R committee - images of an operating table come to mind). The report, not surprisingly, rejected the idea of housing all freshmen on campus next fall because of the logistical problems it posed. The rest consisted of lofty talk of faculty-student interaction and some nice ideas for change. Many of the ideas were, of course, good ones. Who wouldn't want more faculty involvement in rush and more faculty-student interaction? Well� maybe faculty. If the faculty's attendance at the meeting was any indication, you'd have to conclude that faculty could not care less about these issues. The sad fact is that faculty attendance, at about 55, was notably above average. But you've got to wonder when above-average faculty attendance still manages to leave a huge gulf in the center section of 10-250. Faculty members who were present certainly removed any doubt about what the faculty could do. Several professors spoke plainly about the futility of getting faculty involved in students' lives. One professor stated that you would actually have to get faculty to commit - gasp! - time and energy to successfully pursue student-faculty interaction. But he admitted that he himself has been unable to muster enough enthusiasm to have more than one freshman seminar in more than 10 years. And as one joke at the meeting made clear, there's no way you'd be able to get the faculty to be part of R/O (or O/R or O or whatever it is going to be called): You'd have to send students to drag faculty back from their August Cape Cod vacations. The meeting brought back memories of the ROTC Task Force's visit to an Undergraduate Association Council meeting two years ago. 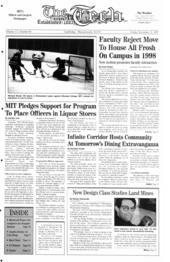 At that meeting, Vandiver himself made little of a faculty resolution made five years earlier (when he was chair of the faculty) stating the faculty would vote to end MIT's ROTC program if the government did not make enough progress toward ending discrimination against gays in the military. The faculty in 1995, Vandiver said, was not at all bound by the resolution, which was not much more than a back-room deal he helped cut. Just a few years later I could see Chair of the Faculty Lotte Bailyn making little of the Chorover proposal, saying it was simply a back-room deal she cut. No one really would be bound by it. With that in mind, why didn't the faculty just amend the motion to read something like, "The President will designate a committee to report back to the faculty every six months on the lack of progress made on these proposals." It sure would beat the pretending. No such friendly amendment was made. The faculty was convinced that things could change. They voted for the Chorover motion because they want to explore the possibilities of what they can take on. They'll do it. Really, they will.